One person is in custody and one person was airlifted to hospital after a possible shooting in Salmon Arm, B.C. One man is dead and another man is in custody after a Sunday morning shooting at a church in Salmon Arm, in the British Columbia Interior. The Church of Christ holds bible classes each Sunday at 10 a.m. and a worship service at 11. B.C. 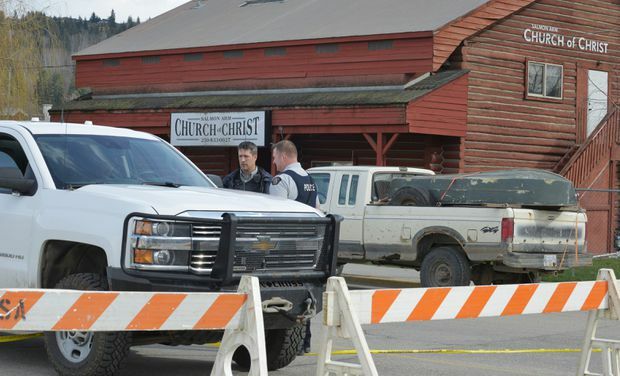 RCMP say that a male entered the church and shot two of the churchgoers shortly after 10:30 a.m. local time. Police say a 25-year-old man had been taken into custody “after being wrestled to the ground by a number of parishioners.” Police seized a rifle. The man remained in custody as of late Sunday, with charges pending. Emergency Health Services declared one man dead at the scene and the other person was transported to hospital in stable condition. Police said the second person was seriously wounded and required urgent medical assistance. A local Global television report identified the deceased man as 78-year-old Gordon Parmenter, citing the man’s son, Dave Parmenter, who said his father had been targeted. Police confirmed a connection between the shooter and one of the victims. “Police have determined that at least one of the victims was known to the suspect, and it is not believed at this time the event was religiously motivated,” Staff-Sergeant Scott West, Salmon Arm RCMP detachment commander, said in a statement late Sunday. One month ago, Gordon and Peggy Parmenter lost their home in a fire, according to an online GoFundMe campaign. The home was in the Broadview Villa mobile-home park in Salmon Arm. RCMP were conducting a criminal investigation and the fire was considered suspicious.